Papaya Cream - A heathy no bake dessert recipe. Papaya Cream can be the solution for when you want a tasty yet not too fattening dessert. Although we will add a little cream in it but you can omit that and use a vanilla yogurt or even plain yogurt. This dessert gets ready in just five minutes. Can it get any better?? There are a few ways you can make this. Look for the variations below. Peel and cut the papaya into 1 inch cubes. Mix the cream and rose syrup briskly. The single cream won't whip nicely, so don't worry if it remains of pouring consistency (remember we are making this a healthy dessert). Sneak a taste and add more sugar or honey or even a little sweetened condensed milk to make it more sweet. Pour this on the papaya and refrigerate until ready to be served. 1) Use any other fruit instead of papaya (Chikoo/sapota , mango etc). 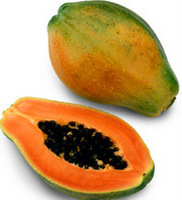 2) Take papaya chunks and blend with a little vanilla ice cream or yogurt. Serve chilled. 3) Use double cream or whipping cream. Beat until it hold peaks. Put the papaya chunks, mixed with rose syrup, in the serving bowl and decorate on top using whipped cream.